I’m happy to report that my 10-year reunion has come and passed. And while I only went to the barbecue on Saturday afternoon (which was moved indoors because of the weather), that was clearly enough. What a scene it was. So little excitement about the planned events. So many generalizations (“Everyone lives in New York” or “Everyone has a kid,” for example). And so much denial and excuse-making about why people hadn’t stayed in touch (the best one I was told: “Sometimes we just get so involved in our own lives”). I suppose I should leave it at that, though I’m definitely tempted to write a more mocking and detail-filled recap of what went down. Of course, not all was worth mocking. And among the old friends I’ve lost touch with who were in attendance, there were some people I was genuinely happy to see and enjoyed speaking with. But most importantly, the real reason I went to the reunion was to get a new umbrella, and on the way out, that’s exactly what I got. It made the whole two-hour experience totally worth it. 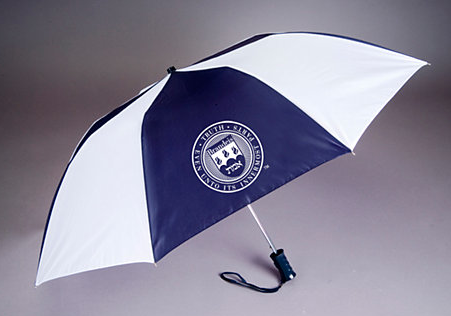 Hopefully this umbrella will last longer than my other one so I can skip the 15-year reunion altogether. Maybe if you had bothered to stop and actually speak to me at the reunion you would have had nicer things to say about the people you encountered. Just a suggestion. And, it’s too bad that you seem to have become such a hard person … almost bitter. What happened to the party, Marty? I have to say I agree with your posting about how fake people were at the reunion. (I was also wondering if any of the girls from our class ever eat.) But your comment in the little book about how your desparate to get married should be filed under TMI. Why do you think being married is the end all, be all? If you ask me your better off staying single. Well, some girls in our class clearly have eaten. But more importantly, I never used the word “desperate.” I said “hopeful.” There’s a difference. CLEARLY you have no idea what it is like to watch a loved one die and not be able to do anything about it, except find comfort in other ways that are not always in your control … or the best thing for you. Besides, YOU are the one who talked about the freakin brownies and look like you’ve enjoyed more than your share of sweets since 1996. What’s YOUR excuse? Lonely?I hope you don’t come to the 15 year reunion, but I’m sure you will change your mind if you have a wife to show off and then you will be JUST LIKE those you were critical of on Sunday. Mark my words, Lieberman. And thanks. Hey Marty….Love the blog! It was great catching up with you at the reunion. You look great and glad to see you are doing so well. You’re still the one man party! Can’t wait to see you at the 15th if not before! Can’t wait for the “more mocking and detail-filled” recap. Make sure you include more fiction like the latest posting. who’s the angry-at-you “anonymous?” you SO don’t deserve his/her attacks. my two cents on marty-10-years-out: you just rock! sounds like life is good, you look great, and i’m glad you are finding happiness and adventure! If he hadn’t made the remark about how some girls HAVE eaten, I would have left well enough alone. Didn’t you find what he wrote about reunion a bit mean-spirited? Obviously, he must have spoken to you at the reunion. He ignored me. And, I bet you weren’t even once one of his good friends. Adios. 1. it’s been 10 years! LOTS of us have out on weight. if you are one of us, i hope you make some peace with it and stop attacking marty. 2. no, i didn’t find it mean-spirited at all. i think it is a pretty accurate depiction of what reunions are all about. kudos that he had the courage to say it. 3. if you are so upset that they two of you didn’t speak at reunion, why did you not approach martin? as they say, “the road goes in both directions.” i was happy to talk with marty on saturday. i was, and REMAIN, a good friend. maybe it’s just that he didn’t want to talk to you…. seems totally appropriate, given how nasty you are to him.4. it’s time to move on. really. like i said before: 10 YEARS! let it go, anonymous, just let it go…anyone care to share the popcorn? can we add extra butter? [munch munch munch]zhis is shome good popcorn. To Meanonymous – I don’t think its mean-spirited for Marty to notice how generic and uniform the attendees presented themselves. Indeed, I think Marty was rather brave for voicing what you rarely hear at such gatherings: discontent. As for the rest, having known Marty for 16 years, I can tell you that you won’t find a more loyal, unflagging friend in the world. Make plans with Marty on March 11, 2021, and he’ll make the reservations. Wait, he told you he was free on March 11 2021? He told me we would be having dinner and a ballgame that night! That lying cheat! That is it, I take back everything nice I ever said about Marty…. Marty told you he’d take you to a ballgame on March 11? They’ll still be in spring training on March 11. I would have turned him down on the spot. Who’d want to go to a spring training game?